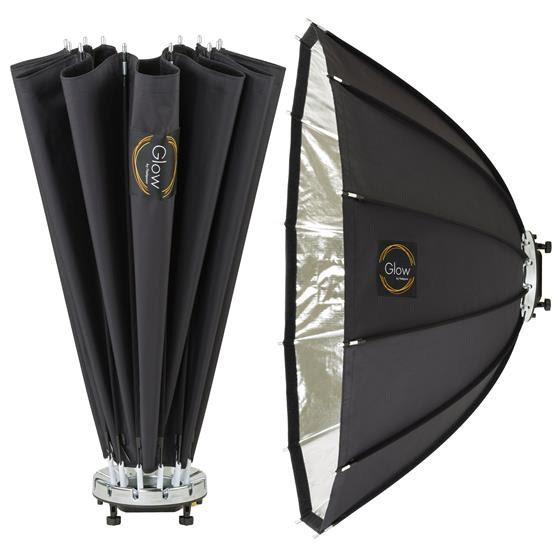 New York, NY – July 28, 2015 – Glow, the award-winning brand of high quality lighting modifiers for professional photography and video production, has just announced two new additions to its softbox collection – the Glow QuadraPop 24”x34” and the Glow ParaPop 38” Portable Softboxes. The perfect solutions for speedlights, studio lights and large portable strobes, Glow’s latest models feature excellent softbox quality, marrying a sleek look with superior, innovative design for the “pop” of innovation needed in every imaging scenario. 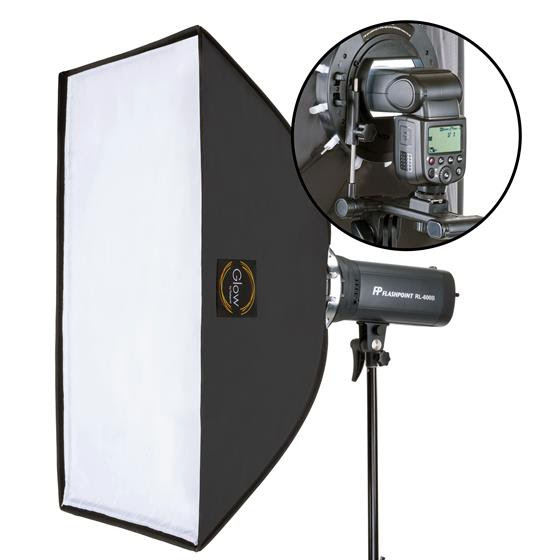 Both models are available with speedrings for five popular types of speedlights, monolights and studio strobe heads. The interchangeable speedrings align either light modifier with virtually every brand, allowing creative imagemakers the flexibility and value of using their modifier of choice with any type of lighting and/or brand in their gear kit, simply by changing out the speedring. Because of their durable, easy-to-use and lightweight frames, both the Glow QuadraPop and ParaPop are perfect for mobile portraits, and travel photography and videography in addition to studio work. They are ideal for imaging enthusiasts of all levels, from novice to professional. The QuadraPop 24”x34” and ParaPop 38” Portable Softboxes are now available online at Adorama.com and at the Adorama superstore, located at 42 West 18th Street in New York City. The lightweight, rectangular QuadraPop 24”x34” opens and closes with speed and ease, providing ultimate portability with one snap. It was designed by engineers using UV-A and UV-R diffuser materials, to reduce UV light by up to 98% and make it exceptionally heat and water resistant. With no falloff from edge to edge, it combines the strength of a portrait key light with all of the benefits of a soft wrap, blending perfectly with any additional fill. Its rectangular shape lights evenly and makes it a popular choice for fashion, portrait, child and beauty photography. The Glow QuadraPop is now available from Adorama for 199.95 USD. Like the QuadraPop, the ParaPop 38” snaps into action with jointed positioning rods that open, close and lock with one click. The ParaPop’s unique 12-sided shape and parabolic profile provides a huge 105-degree light spread. It creates sun-like shadows that are slight and beautifully graduated, giving dimension where it is needed the most. The size and shape of a softbox determines how soft and seamless shadows look on a subject, and the ParaPop 38” is being quickly recognized for creating a gentler, more pleasing final shot. Learn more about softbox sizes from photography expert Gavin Hoey at the Adorama Learning Center: http://www.adorama.com/alc/0015011/article/softbox-size-vs-soft-light. The Glow ParaPop 38” is now available from Adorama for 249.95 USD. The Glow line of light modifiers for photography and video is comprised of universal lighting accessories that mold and shape light, changing its quality and bringing its function to a whole new level. Fully compatible with all brands of strobes and lights, Glow umbrellas, softboxes, reflectors and beauty dishes are crafted of the highest quality materials for durability and longevity. Innovative designs make our modifiers easier to use, bringing advanced lighting setups and tools within reach of the creative vision – and budget – of every photographer. Glow’s Grand Softbox was named Best in Show by Professional Photographer magazine in its 2014 Hot Ones Awards. Available exclusively at Adorama, customers can visit the Glow brand store online to buy: http://www.adorama.com/brands/Glow.